When you start cutting out flour and sugar, you would not believe how depressing breakfast can get. Slowly, I've found little tricks that make it bearable again, like this recipe for lower-carb pancakes/crepes. I found a different version online with all egg whites, but my version is so much simpler, and has no waste. Three ingredients. Directions: Blend everything in a blender or using an immersion blender. Heat pan to medium high, and cook about half the batter at a time for one crepe/pancake (thickness determines whether you want to call it a crepe or pancake!). Delicious served with fresh fruit, like these balsamic-roasted strawberries. I originally posted this combination in May of 2009, when we were in the middle of strawberry season and I had just discovered balsamic-roasted strawberries. 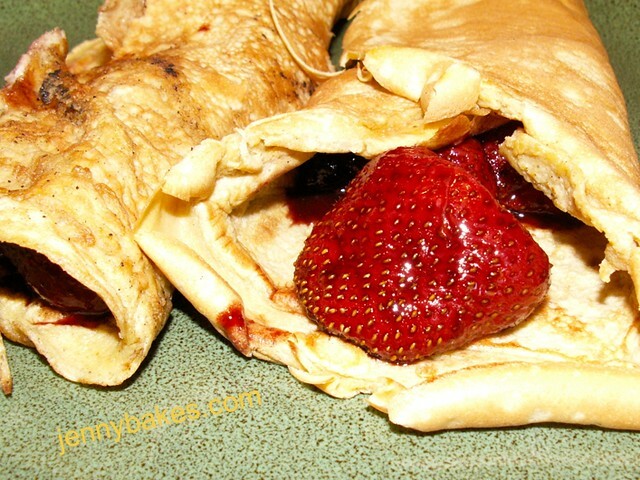 That was with traditional crepes, but they are just as good with this recipe! (I sprinkled a little Splenda on the berries instead of sugar). This time around, I barely had time to make the nutmeg cake, but I'm bookmarking the nazook for when I finally get to my pick for Armenia in my Around the World reading challenge - Rise the Euphrates. But that is a post for another day. For this day, let me focus on my delicious disaster. I learned something new in doing this challenge, actually. One can not simply replace a 9-inch cake pan when a 9-inch springform pan is called for. I imagine I actually know this. But I didn't have one of those other things (secret reference to So I Married an Axe Murderer), so I just tried sticking it into a regular one. So I had to bake it 20 extra minutes. And the crusty part didn't really set up. And I'm not really eating sugar anyway, so I was going to bring this in to my student workers. And now it is ugly and falling apart so I'm not sure I can. Ah well. The nibble I had was absolutely delicious, so I'm adding this to my recipe file of cakey breakfasty goodnesses, and a 9" springform pan to my shopping list. Strawberries are going full throttle, and I still had some of last year's rhubarb in my fridge. 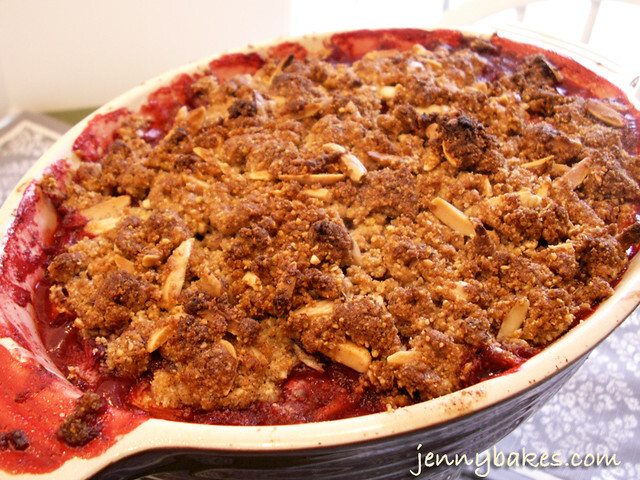 I looked up a few low-carb crumble/crisp recipes online but they sounded bad, so I decided to wing it and just mix some things together that I had on hand. For once, it worked! The brown sugar Splenda doesn't seem as chemically flavored, or maybe it helped that I didn't use much, and just let the sweetness of the fruit speak for itself. Since my rhubarb was starting out frozen, I did sprinkle the fruit with 1 tbsp of cornstarch, but I'll list that as optional. Look, unless you have some arrowroot on hand and know how to use it so it doesn't go gummy on you, that might be a better alternative, but I figured 1 tbsp wouldn't take it over the top. 2. Prepare fruit and mix in citrus juice, optional cornstarch, brown sugar substitute, and spices. 3. For crumble, mix dry ingredients together. Cut butter into squares and mix with fingertips until incorporated (doesn't need to be at room temperature). Mix in almonds. 4. Pour fruit into pie plate or other baking pan similar in volume. Top generously with crumble mixture. 5. Bake for 45 minutes, or until mixture is bubbling. Let me know if you try it, and what you think! I'll probably use a similar recipe with fruit throughout the summer and fall. I can't wait to try it with apples! We haven't been having our typical scone Sundays, and I've been desperate for something tasty for a lazy weekend breakfast. 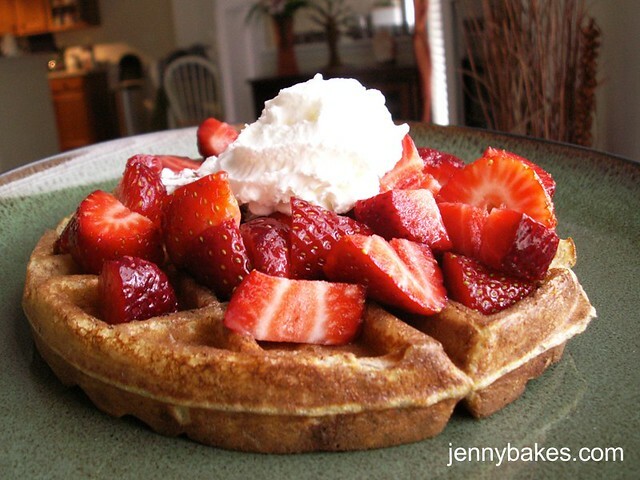 In hunting around the internet for low-carb breakfasts, I came across the Diabetes Daily forums, and this low-carb, gluten-free waffle recipe. The most impressive part? They actually TASTE GOOD. The ingredients are a little strange seeming at first - vanilla whey powder (like what you use for protein shakes), ground flaxseed, sugar free coffee syrup (I just used a lesser amount of maple flavoring), baking powder, eggs, and milk. 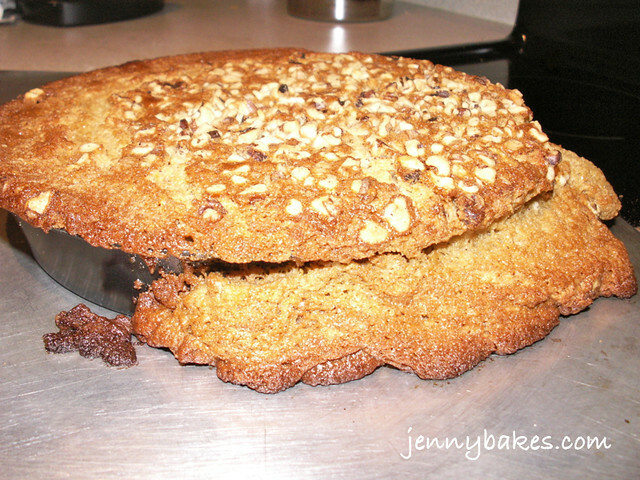 The batter looks runny and disturbing with all the flaxseed, but it bakes up nicely. I double the original recipe, so the version I'm presenting below makes about 3 Belgian waffles. Mix everything together and bake in a waffle maker. When I was gathering recipes for my Around the World baking challenge, I came across The Italian Baker by Carol Field, probably because a revised edition came out recently. I poured over recipe after recipe, through breads and pizzas, until I ended up in the dessert section. 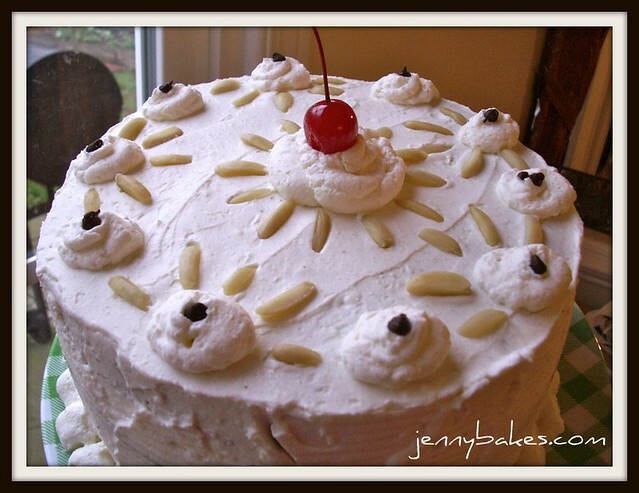 The most interesting cake, the cassata, was explained as a traditional cake for Easter. I knew I needed to save the recipe for Easter week, and to hunt down a book set in Sicily to accompany it. So here we are, Easter week! There were a few bits in the recipe that made it less appealing; I particularly was not won over by the icing and marzipan, traditional as it was. 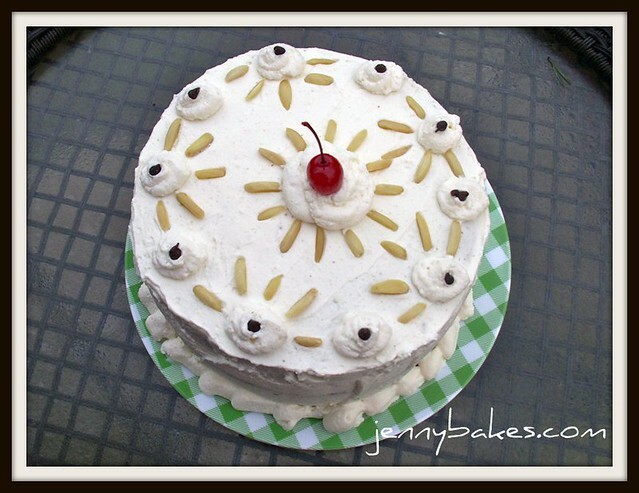 I dug around the internet and discovered that quite a few bloggers I follow had baked a cassata together in 2008. (You can head over to La Mia Cucina for recipes and pictures of her version.) I liked the sound of their filling - heavier on nuts and chocolate, lighter on candied fruits than the traditional - and I liked their icing - a whipped cream cream cheese frosting. I made the entire cake in one night, from cake baking to syrup simmering to frosting making to assembly. The only thing that waited for morning was the maraschino cherry in the middle. 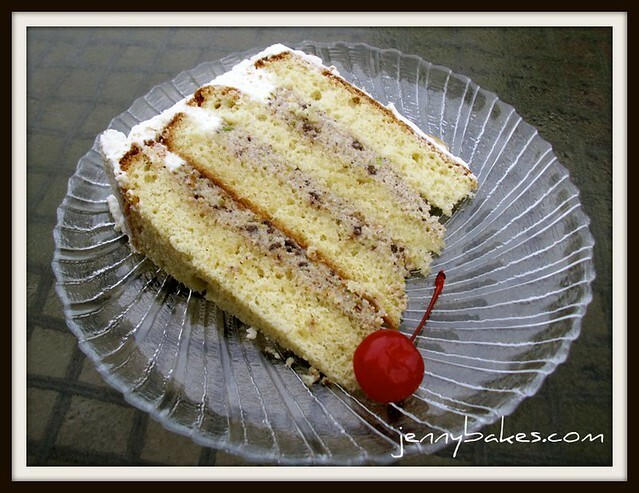 In the end, the best description of this cake is that it is a cannoli cake! The cake absorbs the rum syrup, making it sweeter. The filling is primarily ricotta with all these flavors and textures mixed in - I just used a food processor to mix the cheese with the pistachios, chocolate chips, cinnamon, orange zest, and extracts. Instead of assembling the cake in a springform pan (as I do not have a 9" springform), I used a trick from my old cake decorating days of making a stormwall circle of the outside icing around the perimeter of each layer before adding the filling inside the circle. I chilled the filled cake about 30 minutes before icing the outside, then let it sit in the fridge overnight. I think you can see from the slice that the final cake did not suffer from this treatment - the layers are even, and firm. The icing didn't weep or slide around. And I thought it was delicious! In my preparation, I came across a beautiful travel blog entry on Sicily. Who wouldn't want to visit the land of this delicious cake? 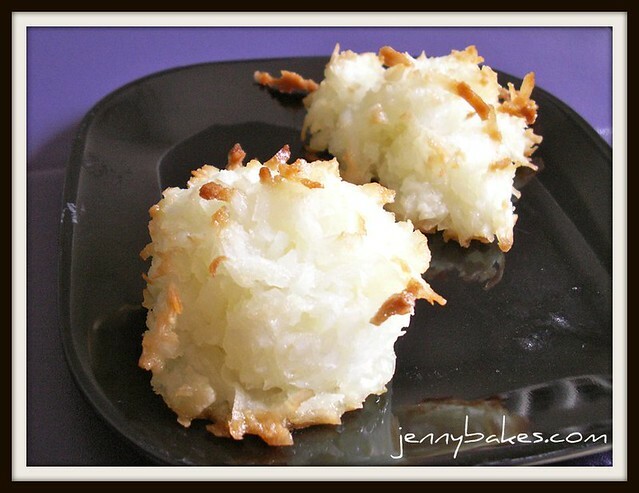 I made the coconut macaroons recipe from Skinny Taste, based on a recommendation from my friend Kasia. I've never made macaroons before so I don't know how these are any healthier, but they are tasty just the same! Lots of holidays coming up for lots of religions - I have a massive Easter cake to post about in the next few days, so I thought I'd post a Passover-friendly recipe first. Not much to say, too late at night to be very reflective.